The major grant will support vital accessibility and infrastructure improvements at Frank Lloyd Wright’s Taliesin West. The National Endowment for the Humanities (NEH) has announced the Scottsdale, Arizona-based Frank Lloyd Wright Foundation (Foundation) as a recipient—one of only 29 nationwide—of a major grant under the NEH’s new Infrastructure and Capacity-Building Challenge Grant program. The grant funding, totaling $176,106, will support a three-part effort by the Foundation to improve accessibility and plan the replacement of water infrastructure at Wright’s Taliesin West, Scottsdale’s only National Historic Landmark. The projects will be completed over the next 2-3 years. “This grant from the NEH will help us achieve our vision of inspiring the world—regardless of ability—with beautiful spaces that are thoughtfully designed and experienced,” said Stuart Graff, Foundation president and CEO. The first part of the project is to address major accessibility challenges at the space, enhancing the inclusivity of the site’s public events. This will include the addition of handrails, ramps, and accessible restrooms throughout the site. Southwest Shakespeare performs in the Taliesin West Music Pavilion. The second part of the project will provide the design of a new engineering plan for the water and sewer infrastructure on the site. Third, NEH funds will help upgrade the sound, lighting, and staging in the site’s historically significant Music Pavilion, where live theatre, lectures, and concerts are regularly held. “This is more than good citizenship toward our friends with accessibility challenges; Wright’s studio and Fellowship comprised a diverse group of men and women, and enabling all visitors to participate in our programs is one way that we advance his legacy as a model for how to come together in community,” Graff said. 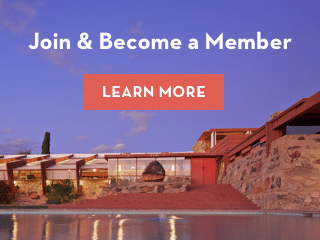 A lively community, Taliesin West is open to the public and offers a broad range of tours, from a Behind-the-Scenes Tour to the stunning Night Lights Tour, where the romance of Taliesin West comes to life.